Is your social media spiraling out of control? Do you have more Facebook pages, logons, passwords, Twitter profiles, HootSuite accounts than you know what to do with? If the answer to this question is “YES”, then this is the series for you. 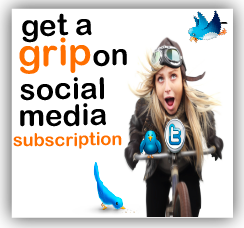 This new series is going to be filled with tips and tricks to help you get a grip on your social media. From stopping random acts of marketing, aligning with business goals, measuring success to date to setting a plan to succeed going forward we're going to provide you with tips, tricks, reminders and guidance along the way. Nobody should have to go it alone. We're all much better as a team than we are as individual silos. Subscribe to the series for updates and access to special videos, webinar training and more. Would love to hear your input and have you participate in discussions and debates as we challenge each other to get a grip on what is holding us back from real success in both life and business.